Welcome to the BAETS Surgeon-Specific Outcomes website. This site provides data on the outcomes of thyroid surgery performed by BAETS members in the UK between 1st of July 2012 and 30th of June 2016, and is an update of the results published last year as part of NHS England's initiative to publish surgical outcome data from a variety of national audits. Data were extracted from the BAETS database on 3rd January 2018.. Overall, outcomes are similar to those reported last year. Mortality of thyroid surgery remains, reassuringly, extremely low, less than 0.1%, with no surgeons reporting a mortality rate greater than that expected by chance. The circumstances of all reported deaths were also examined, and in no case was death directly related to any surgical complications. Early re-operation to control bleeding in the neck is approximately 1%. Levels of missing data on the main outcome measures continue to improve this year at 7.9% on average. The British Association of Endocrine and Thyroid Surgeons is a group of UK surgeons with a specialist interest in surgery of the endocrine organs (predominantly the thyroid, parathyroid and adrenal glands). Since 2004, the BAETS has operated a national audit of its members' surgical procedures, via an electronic submission format, in conjunction with Dendrite Clinical Systems Ltd., with the aim of documenting certain complications of endocrine surgery. Access to the audit is restricted to full members of the BAETS, with data being entered by the individual member. Outcomes for thyroidectomy were published at individual surgeon level, for the first time in July 2013, as part of NHS England's national audit initiative, were updated in 2014, 2016, 2017 and again in the current publication. The thyroid gland is located in the neck, and is responsible for producing thyroxine, a hormone involved in the control of the body's metabolism. It is made up of two halves or 'lobes', which lie either side of the trachea (windpipe), joined together by a narrow 'isthmus'. Removal of all or part of the thyroid may be necessary: to treat thyroid over-activity, to relieve symptoms from enlargement of the thyroid (referred to as 'goitre'), to provide a diagnosis for a lump in the thyroid, or to treat thyroid cancer. Surgery usually involves removal of either one lobe ('Lobectomy'), the whole thyroid ('Total Thyroidectomy') or the isthmus alone ('Isthmusectomy'). Bleeding in the neck after surgery, which may require re-operation to prevent obstruction of the patient's airway. Low calcium levels in the blood ('Hypocalcaemia'), due to damage of the parathyroid glands, which regulate calcium levels and which lie very close to the thyroid. Hypocalcaemia may recover spontaneously, or be permanent. Changes in the voice, due to injury of the recurrent laryngeal nerves, which control the movement of the vocal cords in the larynx (voicebox). These may recover spontaneously, or rarely be permanent. The results refer to cases operated between 1st July 2012 and 30th June 2016. Results are published only at individual surgeon level. Institutional-level data are not published. Hospitals listed are those where BAETS members who have contributed cases operate. A drop-down list of contributing members is available, from which an individual can be selected. Alternatively, if you know the surgeon's name, begin typing in the box, and the list will condense accordingly. If the name you type is not found, it is likely that the individual is either not a BAETS member, or did not contribute data to the audit during the study period. A drop-down list is available, from which a hospital can be selected. Alternatively, begin typing a hospital name in the box and the list will condense accordingly. If the hospital name you type is not found, it is likely that no BAETS members operated there, or that any such members did not contribute data, during the study period. It cannot be inferred that thyroid surgery is not undertaken there. Either insert a relevant postcode or type in the name of your local town/village. Press 'search by my postcode' and this will load a map showing your location and surrounding hospitals which can be linked to the BAETS audit data. Clicking on the blue hospital icon will link directly to the relevant surgeons' data. If your local hospital does not appear, it is likely that no BAETS members operated there, or that any such members did not contribute data, during the study period. It cannot be inferred that thyroid surgery is not undertaken there. Hospital(s) at which the surgeon operated during the study period. Dates where cases have been contributed to the audit (so that allowance can be made for e.g. surgeons being newly appointed or retiring from thyroid surgery during the period of study). Results are principally expressed graphically, with accompanying explanatory text. Complication rates are generally the number of patients having the relevant complication, divided by the total number of cases for that surgeon, so that lower rates usually reflect 'better' results. In the 'funnel plots', results within the central area (below the red lines and above the green lines) are 'within range' i.e. statistically indistinguishable from the average. Results above the red lines show a significantly higher than expected rate of the complication in question. Further guidance on the interpretation of funnel plots is included in the following section. Please also see the Frequently Asked Questions and Glossary links for further information. Clicking 'Search Again' redirects you to the main Search page. Missing data: where information on a case or outcome has not been entered. Inaccurate data: where information has been entered incorrectly. In the BAETS Audit, responsibility for collection and entry of data onto the audit system rests with the individual surgeon. This may help in ensuring that outcomes are accurately recorded, as there is no reliance on coding of outcomes by third parties, and it is in surgeons' own interests to ensure that results attributed to them are correct. However, it can also contribute to greater levels of missing data, due to limitations or competing priorities on the time allocated to surgeons for such audit activity. With any operation, the risk of certain complications occurring may be affected by features of the patient being operated upon, such as their age or the presence of co-existing illnesses; or by the complexity of the particular operation. Surgeons taking on more complex cases might therefore be expected to have a higher complication rate, even if their performance is no worse than the average. For this reason, some outcomes are reported only for first-time surgery and exclude level 6 lymph node dissection. Even in these sub-groups, however, there may be variation in case-mix, contributing to any observed difference in results between different surgeons. Ascertaining whether or not a complication has occurred is relatively straightforward in some cases e.g. in-hospital mortality, where the outcome is unambiguous and uniformly recorded. For other outcomes, however, this may be complicated by differences in measuring, interpreting and recording the outcome. 'Late Hypocalcaemia' is currently defined as 'the need for calcium +/- Vitamin D supplements to maintain normal blood calcium levels at 6 months'. This is intended to be a surrogate measure of permanent parathyroid damage. There are two main nerves to the voice box, one on each side of the neck, called the recurrent laryngeal nerves. These nerves may be damaged during surgery, which may result in loss of the normal movements of the vocal cords, known as vocal cord palsy. When looking at the rate of vocal cord palsy, allowance must be made for the 'number of recurrent laryngeal nerves at risk'. For instance, during total thyroidectomy the nerves on both sides of the neck are exposed to a risk of injury, whereas during removal of only one lobe of the thyroid (lobectomy), only one nerve is at risk. Surgeons may vary in the proportion of their cases that are total thyroidectomies or lobectomies, which may affect the number of patients with vocal cord palsy. Diagnosis of a vocal cord palsy(paralysis of one or other vocal cord) can only be made if the movements of the vocal cords are formally assessed after surgery, usually by fibre-optic laryngoscopy (inspection of the vocal cords with a narrow, flexible telescope via the nose). Some surgeons routinely perform post-operative laryngoscopy on all their cases, while others only do so selectively, perhaps due to vocal symptoms. Some patients may have a vocal cord palsy and yet not notice a significant change in their voice. Therefore, the true rate of vocal cord palsy will be under-estimated by surgeons who do not check the vocal cords routinely after surgery. Conversely, those surgeons who do routinely assess post-operative vocal cord function will naturally have a higher rate of detected vocal cord palsy than those who do so selectively, irrespective of the quality of surgery. The timing of the first post-operative vocal cord assessment will also influence this rate (earlier assessments leading to a higher rate, because many vocal cord palsies are temporary). Surgeons vary greatly in this regard, and this information has not, until recently, been recorded in the database. The BAETS recommends routine post-operative laryngoscopy. However, not all surgeons have ready access to this investigation, and some patients may decline it. Rates of laryngoscopy may therefore vary between surgeons due to factors beyond their control. Vocal cord palsy after thyroidectomy is usually temporary, but can sometimes take several months to recover fully, and sometimes does not recover. If it does not recover, it is deemed 'permanent'. The time interval after surgery beyond which any cord palsy is deemed 'permanent' varies between surgeons, making comparison difficult. Recent updates to the database have addressed this issue, by defining afixed length of follow-up (6 months) for this outcome, but this change occurred after the cases described in this report. Some types of thyroid surgery may be more likely to result in a vocal cord palsy e.g. surgery for more advanced cancers or for large goiters extending into the chest. Some surgeons will operate on a greater proportion of these patients than others. The rate of missing data for post-operative vocal cord assessment is relatively high. For an uncommon complication such as persistent vocal cord palsy, this makes estimates of outcomes particularly unreliable. The rate of vocal cord palsy for any surgeon can therefore be affected by the make up of their practice, the proportion of their cases having a post-operative vocal cord check, and at what interval after surgery this is performed, as well as the quality of surgery. For these reasons, this report concentrates on surgeons' rates of performance of post-operative laryngoscopy and degree of missing data. Data on persistent vocal cord palsy should be considered approximate only, so that comparison between surgeons with respect to this outcome cannot be considered valid at present. Even when the overall risk of a surgical complication is known, the exact number of complications observed for any one surgeon will be prone to some random variation. Statistical methods can help identify whether or not the observed variation might be expected by chance alone. Traditionally, 'confidence intervals' are calculated, outlining the limits beyond which chance is less likely to explain the observed variation in outcome. For the purpose of comparing individual surgeons, confidence limits of 99.9% are often used. 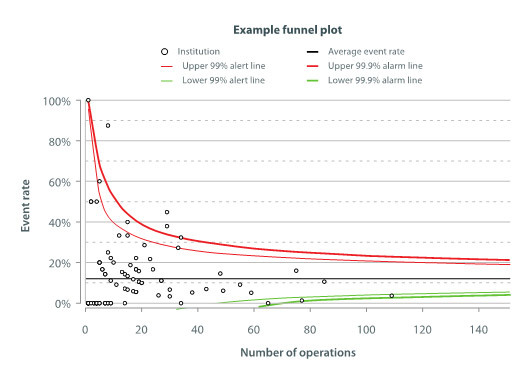 For some outcomes, comparison between surgeons can be shown in the form of a 'funnel plot', as in the example below, and this format is used for some of the outcomes reported here. Each surgeon is represented by a 'dot', showing that individual's number of cases and the corresponding percentage of those cases having the complication in question. The black line shows the average complication rate for the whole group of patients (across all surgeons), while the green and red lines show the limits of the confidence intervals, in this example with pre-set values of 99% and 99.9%. Results within the central funnel (between red and green lines) are considered 'within control limits' i.e. not statistically significantly different from the average. Results outside the central funnel are very unlikely to have arisen by chance alone, if the surgeon's performance were truly average (0.1% or 1in 1,000). Other reasons are more likely to explain such results. These might include inaccurate data entry and differences in measuring outcomes, as well as poorer surgical performance. The example funnel plot below would suggest three individuals whose results are likely to be 'truly' higher than average. The BAETS remains committed to using its national audit data to improve the quality of information available on surgical outcomes, and to help contribute to professional development of its membership. This website represents one facet of this process. Updates at least annually, with additional information on other types of endocrine surgery, are anticipated. What is the aim of the BAETS Endocrine Surgery Registry? The aim of the registry is to provide information on outcomes of endocrine surgery (principally surgery on the thyroid, parathyroid and adrenal glands) in the UK, in order to improve standards of care, through a process of continuous audit. Who is responsible for running the Registry? The registry is a collaborative project operated by the British Association of Endocrine and Thyroid Surgeons (BAETS) with Dendrite Clinical Systems Ltd. The BAETS is a specialist association of British surgeons who have an interest in endocrine surgery, and is recognized as such by the Department of Health, the Association of Surgeons of Great Britain and Ireland, and the British Association of Surgical Oncology. Dendrite Clinical Systems Ltd. is a specialist supplier of clinical databases, operating multiple national and international clinical databases. Patient data are anonymised at the point of data submission. Dendrite Clinical Systems Ltd. hold the key to surgeon and hospital codes, but do not hold data enabling identification of any individual patient. Data are held centrally by Dendrite Clinical Systems in accordance with UK Data Protection laws. Data cannot be released without the written permission of the BAETS. Since 2013, the data have been used to publish individual BAETS members' outcomes for thyroid surgery, in comparison with the national averages. The data presented on this website represent an update of this process. Individual surgeons are also able to view/download their own results, enabling feedback on their own performance, and thereby contributing to continuous improvements in outcomes. The BAETS also has an 'outlier' policy, whereby surgeons whose nationally published outcomes appear significantly worse than expected can be notified and supported to identify potential areas for improvement. What results are available on this website? The length of hospital stay following surgery. The rate of re-admission for reasons related to the surgery. The rate of re-operation for bleeding in the early post-operative period. The rate of low calcium levels in the blood after total thyroidectomy. The extent of completeness of data entry. Information on post-operative assessment of vocal cord function. Why are the published outcomes restricted to thyroid surgery? Thyroidectomy represents the commonest type of endocrine surgery, and was therefore felt to be most appropriate for the first rounds of outcomes publication. It is planned, however, to expand the range of outcomes published in future, including those of other endocrine operations, such as parathyroid and adrenal surgery. What is the relevance of mortality rates in thyroid surgery? Death after thyroid surgery is, reassuringly, extremely rare. In most cases, such deaths are not directly related to the surgical procedure, and may be due to heart attacks or strokes, for instance. Rarely, some thyroid operations may be performed to alleviate symptoms in patients with advanced cancer, where subsequent death results from the underlying disease, rather than the surgery itself. By chance, surgeons will therefore inevitably have either one or no patients dying after thyroid surgery, and there are no statistically sound methods to compare such low complication rates.
. Mortality rates are reported for completeness, but, for thyroid surgery, are not considered related to the quality of surgical care. Why is my local hospital/named surgeon not listed? The published results derive solely from the BAETS audit database, which is only accessed by BAETS members. Data submission has traditionally been voluntary, although recently has become a mandatory aspect of BAETS membership. Not all surgeons who perform thyroid surgery are members of the BAETS. Surgeons may therefore not be listed if they are not BAETS members or they are members who have not submitted data for the period of analysis. Hospitals may not be listed if they do not have a BAETS member who contributed data for the period of analysis. Why can I not view all surgeons' outcomes together e.g. in a table? Some complications are relatively rare, so that estimates of the true complication rate are very unreliable for surgeons with a smaller case-load. No established statistical models exist for risk-adjustment, so that surgeons taking on more complex cases might have apparently worse outcomes. The results presented here are 'risk-stratified' by excluding a small number of cases with the highest risk of given complications (re-operations and central neck lymph node dissections), but differences will still exist in the complexity of surgery between the remaining cases. Multiple different outcomes are presented. Some surgeons may have rates 'higher than average' for some complications and 'lower than average' for others. Therefore, it is difficult to give an overall rating of the quality of surgery. The completeness of data varies between surgeons, and might significantly affect the reported complication rates. The BAETS feel that results are better expressed by alternative means, including funnel plots, which allow for improved understanding of an individual surgeon's results within the spread of data. Who might find the published information useful? Patients may find reassurance that their surgeon is participating in a process of professional audit, and may wish to ascertain how often their surgeon performs thyroid surgery, what types of surgery are performed, and how that surgeon's complication rates compare with those of other thyroid specialists. This information may be useful in discussions with a patient's General Practitioner regarding referral to a thyroid specialist, but cannot replace GP's local knowledge, and is not recommended as the sole means for selecting a thyroid surgeon. GP's and Health Service Commissioners might find the data helpful in supplementing knowledge of local services in thyroid surgery. Hospital Medical Directors and Executive Boards may refer to the data, to confirm that their local specialists are contributing to national audit and that their performance is acceptable, or to put in place remedial action if that is not the case. Surgeons will gain improved insight into their own performance, helping to maintain or improve standards. Healthcare Researchers may derive useful academic information. British Association of Endocrine and Thyroid Surgeons: a group of UK surgeons with a specialist interest in surgery of the endocrine system. A common cause of thyroid enlargement where the thyroid is occupied by multiple, non-cancerous nodules (lumps). May cause symptoms due to the size of the thyroid or sometimes due to over-production of thyroid hormones, when surgery can be used in treatment. Often also referred to as 'multi-nodular goitre'. Relating to those organs responsible for producing hormones (substances released into the bloodstream which regulate the function of other, remote organs). Thyroid surgery, where no previous surgery on the thyroid gland has been performed; as distinct from re-operative thyroidectomy. A disease of the thyroid gland in which the body's immune system produces antibodies, which can stimulate growth and activity of thyroid cells.One of the commonest causes of an over-active thyroid (thyrotoxicosis), when thyroidectomy can be used in treatment. A method of showing a surgeon's results, compared to those of all surgeons, and to the national average. See Introduction section for guidance on interpretation of funnel plots. Low calcium levels in the blood. May arise after thyroid surgery, due to damage of the parathyroid glands, which sit next to the thyroid, and which control blood calcium levels. Inspection of the vocal cords and their movements, usually by a flexible telescope inserted through the nose as an outpatient procedure. Removal of certain lymph nodes in the neck, usually as part of treatment for some thyroid cancers. Lymph nodes are small, oval organs, present throughout the body, which are part of the immune system, acting as filters for foreign particles and cancer cells. Nerves to the voice box, responsible for controlling the movements of the vocal cords, important for voice production and coughing. May be injured in thyroid surgery. A gland situated in the neck, responsible for regulating the body's metabolism, by production of thyroid hormones. The principal hormone released by the thyroid, and which may be taken as a tablet to replace the function of the thyroid after thyroidectomy. Removal of the whole thyroid gland. Loss of the normal movements of one or other vocal cord, which may be due to injury of the recurrent laryngeal nerve(s) during thyroid surgery. May result in a hoarse/weak voice and swallowing difficulties. The BAETS is recognised by the Department of Health, the Association of Surgeons of Great Britain and Ireland (ASGBI) and the British Association of Surgical Oncology (BASO).